Poldarked: Filming 'Poldark' in Corsham - But When? Going to watch the filming of Poldark in Corsham? Then read on. 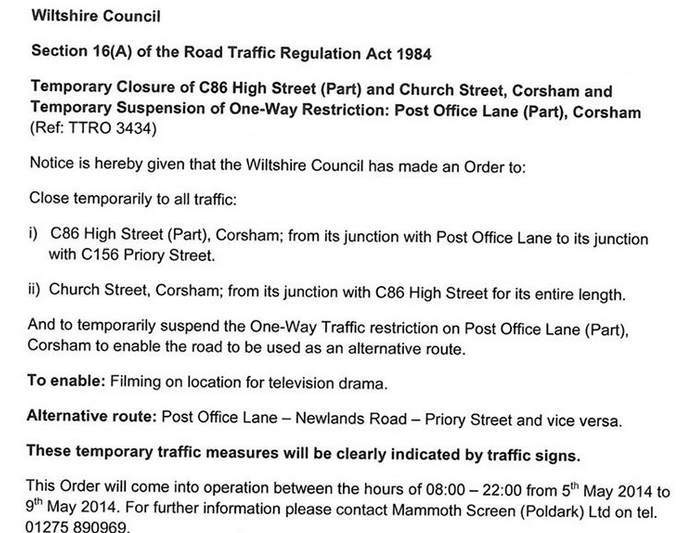 The Wiltshire Gazette and Herald says that filming will take place on 4 to 8 May, 2014. However, in the announcement of the temporary road closure for filming, Wiltshire Council say the roads will be closed Monday 5 to Friday 9 May. The roads will be closed between 8.00 am and 10.00 pm on these days. Of course, it may be that they don't need to close the roads on 4 May and that there will not be filming on 9 May, but the discrepancy in the dates does mean there's some confusion. Here is the Road Closure Notice. Corsham Council does not know if this period of closure includes the time for preparing the buildings and the lighting or if it is just the filming time. Poldarked is waiting to hear from Mammoth Screen as to the filming days and we'll be sure to keep you up to date.